Dogs and snakebites are a common problem in summer as temperatures begin to soar. There is far more snake activity and thousands of pets end up at veterinary clinics with snakebite. Cats are highly intelligent and very quick and seldom get bitten, even though they often catch snakes and bring live ones into the house. Dogs, on the other hand, are not always the brightest and with their strong hunting instinct find it difficult to resist attacking snakes. Some dogs are particularly good at killing snakes, especially cobras and even mambas, but short bulky snakes like the Puff Adder strike incredibly fast and the dogs often come off second best. So for those of you that have a highly efficient snake-killing dog, it may just be a matter of time before a snake gets the better of the dog. Farm animals are often bitten by snakes and some even eaten by pythons. 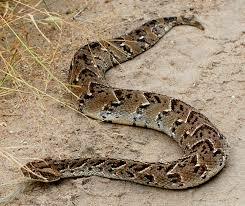 Cattle and horses are mostly bitten in the face with the main culprit being the Puff Adder. Despite popular belief, very few adult cattle or horses are killed by snakes and mambas account for few of these bites. They are extremely shy and nervous and are quick to seek refuge if threatened. They also account for very few bites on humans. In essence, snakebite envenomation on animals is no different from that on humans. Less than 20% of all humans bitten by a snake require urgent medical care including antivenom. Pets and farm animals suffer the same fate and it is not unusual for dogs to get bitten by a snake, have some swelling and to survive without antivenom. If an animal is bitten by a snake and receives a lethal amount of snake venom, the animals will die unless treated with antivenom. If the animal does not receive a lethal amount of venom, it will survive, perhaps with some tissue damage, otherwise it will recover fully in due course. Amputations in dogs are not uncommon and even snakes with relatively mild venom like the Night Adder may cause sufficient damage to necessitate amputation. There are loads of treatments that people resort to in the event of snakebite on a dog or farm animal – giving the dog milk to drink, making it swallow charcoal, giving it Allergex tablets, cutting off the tip of the ears to let the venom bleed out and by far the most brutal – injecting some petrol into the neck of the animal. All of the above is of course a total waste of time and does not help the animal. Despite this treatment many animals still survive. In humans it is recommended that a snakebite victim must be hospitalised as soon as possible and the attending doctors will then treat according to the onset of symptoms. In most bites victims survive providing they get to a hospital within a reasonable time and then receive the correct treatment. A reasonable time, in Puff Adder and Spitting Cobra bites, is within a few hours. As for first aid in such cases there is little one can do other than to get the victim to a trauma unit. Bites from a Black Mamba or Cape Cobra are different as the potent neurotoxins may quickly cause difficulty with breathing and if the victim stops breathing first aiders can resort to mouth-to-mouth resuscitation, CPR of use a bag valve mask to artificially ventilate the patient on route to a hospital. In the event of an animal being bitten by a venomous snake, get it to the nearest vet as soon as possible, no matter how far you have to travel. There is no other solution. In serious cases antivenom will be required and in such cases the animal will not survive without antivenom. In cytotoxic bites (Puff Adder, Mozambique Spitting Cobra, Rinkhals, Stiletto snake, Night Adder) there may be excessive swelling, pain, blistering and subsequent tissue damage and the sooner the antivenom is administered, the less the tissue damage. In Black Mamba and Cape Cobra bites the situation is critical and the sooner the animal reaches a vet, the better its chances of survival. Few animal hospitals have ventilators for animals and that may be critical in these bites. If your pet stops breathing on the way to a vet you could do mouth-to-nose resuscitation but there is little else one can do. Dogs often get spat in the eyes and the eyes very quickly swell closed. This rarely happens to cats and farm animals. Should this happen, immediately wash the animal’s eyes with water by getting it under a tap or use a hose pipe. Gently rinse the eyes for about 15 – 20 minutes and then get the animal to a vet. A bit of local anaesthetic and some antibiotic eye drops usually do the trick and the animal should be fine within a few days. There is no evidence that other substances, like Rooibos tea or baking soda, are more beneficial. Wash the eyes out well using water and get the animal to a vet as soon as possible. 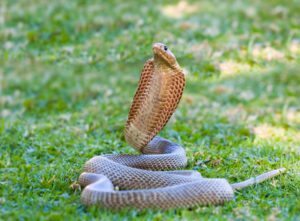 article from African Snakebite Institute.